A new ridesharing service is now available to families in the San Diego area. HopSkipDrive is the creation of three busy moms and now boasts chapters not only in San Diego, but in Los Angeles, Orange County, San Francisco and Denver. The service makes safety the prime concern with drivers going through strict background checks, demanding clean driving records and multiple years or caregiving experience. Families are matched up with drivers who can take kids to and from school and also to extra curricular activities. The company’s web site says that every driver is fingerprinted, all rides are monitored in real time and that parents can even follow along with their available app. 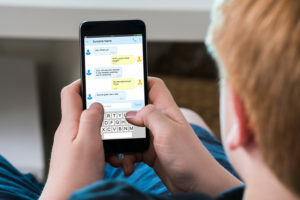 These days, technology makes it possible to track our kids and even see their text messages without them knowing. But, is it right to do that? Join the family fun at KidsFest at the Park featuring bounce houses and other inflatables, games, face painters, balloon artists and more kid-friendly activities starting 2.5 hours before every Sunday home game. The San Diego Kids Expo and Fair is a two day event catering to kids and families. This event contains two parts: an Indoor expo portion housing a large variety of businesses showcasing products and services that cater to kids, babies and families. There will be many free activities, specials appearances and performances. The second portion is the Outdoor fair with a Rock n’ Roll stage and rides including a zip-line, pedal kart race cars, zorbing balls, euro bungees and more! There is also an Inflatable Playland for kids age 8 and younger that features bounce houses and jumpies. Outdoor fair attractions can be accessed with either an All Access Wristband or Playland Wristband purchase. If you are looking for an affordable fun weekend with something for the whole family, the San Diego Kids Expo & Fair at the Del Mar Fairgrounds is the place to be! Ticket is good for either day. *Kids 12 and under admission is free. Most indoor activities are free. An All Access Wristband or Playland Wristband purchase is required for participation in outdoor fair activities. Note: Parking is $14 cash per vehicle at the Fairgrounds entrance. Head out into the fresh air and sunshine to do gardening, plant potting and arts and crafts in the beautiful and serene setting of the San Diego Botanic Garden. COST: Free with admission of membership.